Showing last 10 news posts. Please allow up to 12 hours for your rank to accurately reflect your position on the EHP hiscores. Rankings are determined by players updating their CML after a rate change and will be inaccurate for some time. Pre 99 Slayer ratios to reflect a more melee focused ratio at earlier levels, and a magic focused ratio at later levels. Be sure to follow @CMLBot and join our Discord for the latest updates. Thank you to @NevermoreRS, @JonWilSenze, @Dan_S_OSRS, and others for facilitating discussion and providing accurate rates to reflect these changes. This rate still assumes Black Dragonhide bodies, but it is more accurate. This rate assumes Gold at Blast Furnace. This rate assumes Dharok's in NMZ with Dragon Claws. This rate still assumes Black Chinchompas but is a more accurate rate. This rate assumes using 1 Special Attack Transfer Alt and a Scythe during Slayer. This rate is a more accurate Granite rate and adds value for the Smithing rate. Killing Green Dragons and using the bones on the Chaos Temple altar in the Wilderness. Zeah Library Method. This rate includes the bonus Hunter EHP gained. 1.5t teaks on Fossil Island, creating planks, and making cape racks. This rate still assumes Ardougne Rooftop but now the Herblore XP from Marks of Grace is calculated into the rate. This is built into the Agility rate to prevent people from getting easy over EHP if they were to only do underwater agility, brimhaven, or werewolf. Off task rate which is from various sources such as dagannoths, mole, birdhouse, Kingdom, Wintertodt, and includes extra mining time at Volcanic mine for ash. This is to keep everything consistent and only scale up slayer so that you can get 1:1 in every skill without having to slay. Swimming gaining 220 tears/h with no alt. Factoring in the bonus xp while swimming, using the set Agility and Prayer ehp rates, thieving is scaled to make swimming 1:1. This rate is assuming efficient Slayer but also includes stored EHP (Herblore, Crafting, Prayer, etc. ), 500 Chambers of Xeric kills for Dragon Hunter Crossbow, 39.2K Vorkath kills (on task), and 7.4K Zulrah kills (off task). Click here for an efficient task list. Solo Black Chinchompas. This isn't currently efficient to do, but the rate is used to calculate Runecrafting and Farming EHP as well. Buying and smithing gold at Blast Furnace. Buying, banking, and cooking Karambwans. This isn't necessarily efficient to do, but the rate is used to calculate Slayer EHP. Wintertodt. This rate includes bonus EHP you would get from Woodcutting, Construction, and bankstanding another skill between games. Seeds from birdhouses, Vorkath, and Zulrah. The cooking:fishing ratio from Barbarian Fishing will be changed from .125 to .15 for BOTH Ironman and Main. You'll see the effects of these changes within the next few hours. Make sure to follow CML on Twitter and join our Discord. The Skilling Method discord has been created as a resource for finding guides on all relevant efficient skilling methods. It will be kept up-to-date with all new metas, so is a good place to go if you are unsure what method is used to obtain the current EHP rate. DM the admins @Dan_s_osrs, @Thurco, @ConstellarRS, and @osrs_Rhey with any questions. Swimming has been made EHP again, the previous issues with swimming caused pre-99 has been fixed, swimming only applies post 99 now. The rates for swimming are 43120 Agility xp, and 158070 Thieving xp per hour corresponding to 220 tears per hour. In addition woodcutting has been changed to 200k/hr post 99, this is from 1.5t teaks on fossil island. Potential future changes, 240k/hr attack (single alt at nechs) and single alt lavas. Swimming has been made EHP again, the previous issues with swimming causing issues pre-99 has been fixed, swimming only applies post 99 now. The rates for swimming are 43120 Agility xp, and 158070 Thieving xp per hour corresponding to 220 tears per hour. In order to support Season 3 of Fantasy EHP a new page has been added to the site covering basic information on the competition. This information is the current state of each weeks match and the current rankings overall. For more detailed information you can view the official spreadsheet for the competition, linked on the CML page. You can find the page for fantasy ehp in the header bar, or by clicking this. 10 team captains have been selected. These 10 captains have drafted, turn-based using a snake format, 12 players each (selecting 1 player at a time) until their roster was completed. The captains could freely select between all players in Runescape. The captain will then start 7 out of his 12 players each week, these 7 players are then competing against the 7 players of another team where the objective is to obtain the most EHP. 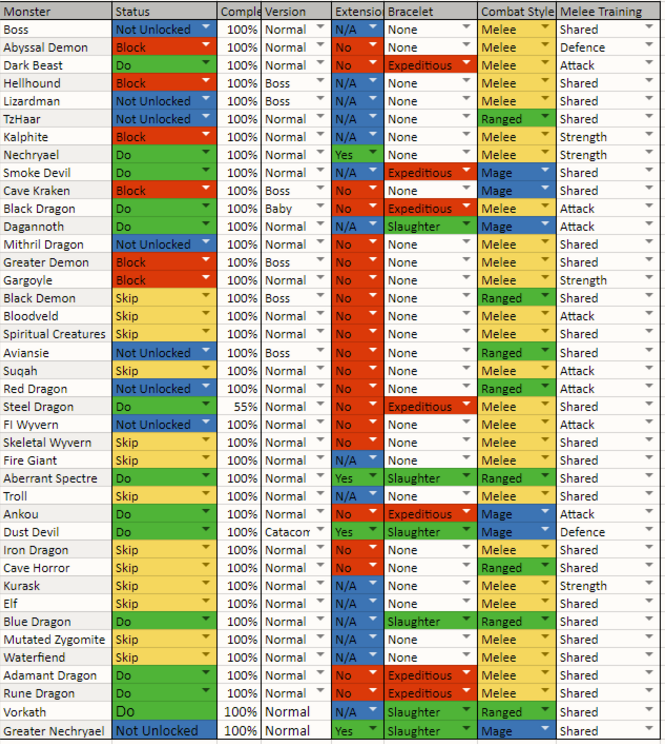 A more detailed breakdown of how it all works can be found in the official spreadsheet. CML now has a twitter bot. @CMLBot. This bot will tweet out your achievements such as setting a record on the records page, achieving a 200m skill, or maxing to help share them with the world. In addition for any 10$+ donors who have their twitter handle linked to CML will be tagged in tweets about them by the bot! This twitter account is also where I will be tweeting any statistics people want to see based on CML data. If you have any requests for statistics you'd like to see feel free to tweet them at me. So go ahead and follow @CMLBot to see player achievements, statistics and news.